YAMAHA YDP143R DIGITAL PIANO REVIEW - Great Value for Money? In this Yamaha YDP143R digital piano review, we will look at what this new digital piano in the Arius series has to offer. The Yamaha YDP143R comes with many advantages that would make you expect it to cost a fortune. Let us go through the characteristics that make this piano have such great reviews from the piano world. 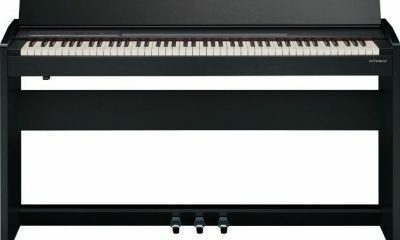 The Yamaha YDP143R is a mid-range digital piano, popular with intermediate and piano students alike. It is an upgrade from a previous YDP-142 model and comes with great features that we will look at below. This instrument comes in a quality and classical looking body that complements the decor of any room. Despite looking heavy, it is quite light enough to move around whenever needed. Additionally, the piano comes with a sliding cover to house the keyboard from collecting dust when not in use. The control panel is quite standard with seven buttons, a Volume knob and a Power button on the right. The piano, unfortunately, does not come with a display panel. However, the user manual will get you started until you memorize buttons. Another easier way is to use the Yamaha controller app to navigate through the piano’s settings. This digital piano comes with 88 GHS weighted key mechanism. This means that the keys will imitate an acoustic piano’s action to provide a smooth touch while playing. The YDP143R comes equipped with the Pure CF sound engine to provide a rich piano sound sampled from Yamaha’s CFIIIS 9′ concert grand piano. The piano has with10 different sounds plus four different reverb types to add depth and ambiance to the sound. Yamaha added two other features in the YDP143R for the purposes of further improving the sound whenever needed. The first one is the Intelligent Acoustic Control (IAC) feature. This will adjust the quality of the sound when in low volume to make bass and treble note audible. The second one is the Stereophonic Optimizer, used when you are using the headphones while playing the piano. This feature adjusts the spacing and the separation of the sound to make it more natural and realistic. The YDP143R has an impressive 192-note polyphony. This means that this instrument can handle even the most intricate and complicated musical selections without dropped notes. The piano comes with two speakers located on each side with a 12W total power output. The sound is further enhanced by Yamaha’s Acoustic Optimizer making it full and well balanced over the entire frequency range. There are two 1/4” stereo jacks at the back of the piano. These jacks are used for connect to your headphones or as a line out for things such as external amplifiers. To connect the piano to your computer or to an iOS device, there is a USB to Host port at the bottom of the piano for that purpose. In addition, Yamaha offers free apps for iOS devices where you are able to control the pianos functions through an interface. The YDP143R digital piano comes with a great build quality and offers the player a rich and authentic playing experience. The graded action gives a realistic performance and would be a great choice for upcoming piano players. This piano could use a couple of tweaks such as adding a display panel for easy control and an addition of built-in songs. However, it is still a great piano that will satisfy any pianist. 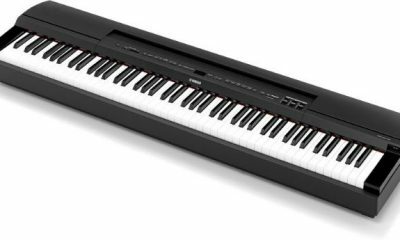 We hope that this Yamaha YDP143R digital piano review has given you plenty of insight to help you come make a purchasing decision.